An Accidental Mysteries “Blast from the Past,” December 16, 2008. THANK GOD FOR OTHER PEOPLE’S COLLECTIONS, because I don’t have the money, space or time to collect it all. I do have the desire to collect it all, but left brain (and wife) says stop. I found a collector, Robert Madison, who apparently loves the beauty, variety and history of cigar box lids. His collection is enormous. I am reminded of the cigar box that Tatum O’Neal (as “Addie”) carried in the movie Paper Moon. It was Cremo brand. It was the perfect metaphor for those few things she held dear to her life. She carried it—held it tight everywhere she went. As a kid, I loved cigar boxes. I guess I still do. Cigar boxes are the perfect size for kid stuff—baseball cards, crayons, coins, secrets—whatever. 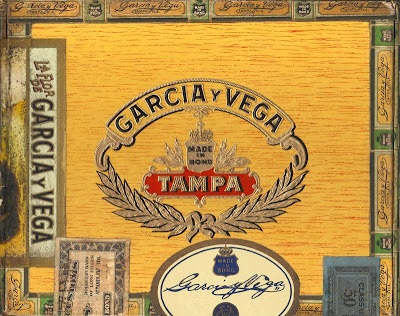 Cigar boxes are kid-sized—the way they open is lovely and inviting. And as far as design, they always look so regal and important. On the lid was usually an illustration or name of some mysterious, important person, almost always with a strange non-Anglo name. And, because the boxes were so substantial, people saved them more so than not. How many garages or workshops in the United States still have a cigar box to hold nails, screws and other flotsam from their projects? Cigar boxes last. The examples I was drawn to from Robert’s substantial collection are the ones that have the tax labels applied along the side and over the lid. Is there anything sexier than breaking an official seal? I mean really! The samples I share with you today remind me of early 20th century collage. 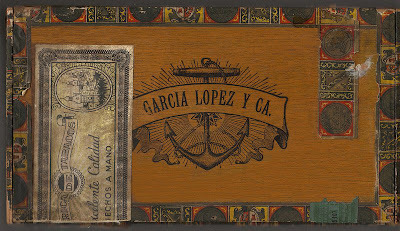 The labels, haphazardly applied compared to the perfection and order of the lid, interfere with and force themselves into the carefully planned cigar box “landscape.” That is what I love the most. 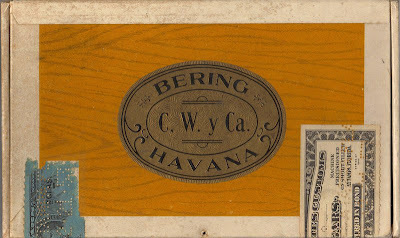 The tax labels were never designed to work with the cigar box. They were there to serve an official function—like a price sticker or a bar code on a product today. 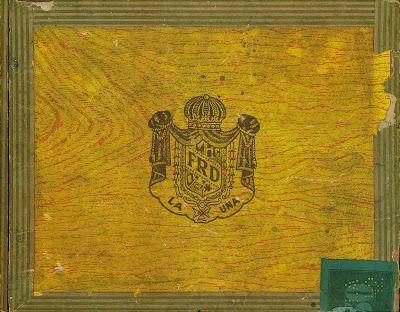 Besides that, I am reminded of something else—the whole role that cigar bands and box labels did throughout the 20th century to inspire artists. One has only to look at the early collage art of Kurt Schwitters, Pablo Picasso, Georges Braque, Joseph Cornell and others to see the influences. And most recently, the discovery of the work of Felipe Jesus Consalvos, a self-taught artist who worked in the first half of the 20th century. 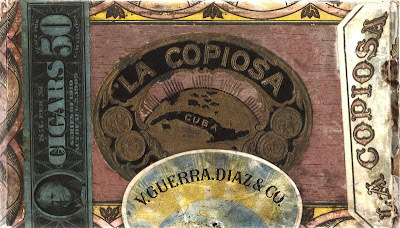 Consalvos worked in a cigar factory and apparently had plenty of raw material from his work to use (cigar band papers). Influenced by the boxes themselves, he utilized a similar visual “framing and border” devices he saw everyday at his job. Of course, all of these artists, trained or self-taught, pushed their “cigar box and cigar band” influences much farther. Consalvos used real cut-up dollar bills, magazine photographs, old wedding photos and all kinds of ephemera to create his surreal, fantastic work. Also, be sure and check out the faux wood grain on some of examples above— a device the surrealists used often. Really Cigar box is one of the collections of every child.Its look is quite attractive and the small box fascinate the children a lot and they keep their articles like crayons,coins, stamps etc in it.They even play with it assuming as a small suitcase meant for them.I do remember collecting such small boxes in my childhood.One of my neighbour was having three to four boxes for storing Cuban Cigars in it.Still now, my eyes get stuck to these beautiful boxes when i see any of them. I love finding old cigar boxes at estate sales that are filled with children's odds and ends. I keep them intact because it's interesting to see what they treasured. You have inspired me to dig them out and post them. Thanks also for your wonderful blog and all of your hard work. I had a friend who had a cigar shop that went out of business. One day he put out a giant cardboard box filled with empty cigar boxes -each was for sale for $2-$5. They are wonderful for housing assemblage art.